How do celebrities look so amazing all the time? You might think it’s because they have bottomless budgets, but that is so not the case. It’s because they have stylists who teach them how to dress, what truly works and what’s not worth the hype. Trudging through the muddy waters of fashion rules and fashion tips can be tough, but it’s safe to say the rules are getting much more lax. We’ve found some of the best tips from stylists and celebrities that are not only attainable and affordable, but that can truly help you own you style. If you ever watched What Not To Wear, you’d know how huge of a proponent Stacy London was about finding a good tailor. She’s not the only stylist who thinks so! Emily Current and Meritt Elliott are both stylists who stress the importance of taking those not-quite-right items to a tailor rather than saying goodbye to something you love. They say “a tailor can work miracles!” Even Kim Kardashian West agrees! One of the ways you can tackle the dreaded “I have nothing to wear!” issue in the morning is to have a go-to outfit that you can put together in a pinch. Stylist Micaela Erlanger has one of her own that she absolutely swears by, and it’s universally flattering. Chances are, you might have these things in your wardrobe already so you can take a hint from her if you need it! It consists of a black blazer, a white button up, skinny jeans, and some loafers. All of these items are staple pieces that you can find inexpensively, or you can indulge to have the best quality. If it’s not you, think of staples you wear all the time and how you can incorporate them into a go-to ensemble. Stylists Mariel Haaen and Rob Zangardi swear by every woman having some shapewear in their arsenal – not because they need to look skinny, but because it can really help make your outfit fit perfectly. No matter what your body type, a piece of shapewear can smooth everything out and can change the way an outfit falls on your body. Just a reminder; not all shapewear is uncomfortable. Look for size and supreme quality. Most women who find shapewear uncomfortable are squeezing into too-tight styles. One of the most common pieces of style advice found from too many stylists to count is that trends are just trends; don’t feel pressured to buy something just because it’s in. If you won’t wear it, if it doesn’t speak to you, or you don’t have the money, don’t buy it. It’s wiser and more wallet-friendly to invest in staple pieces that YOU feel good in and that will allow you to have a versatile wardrobe that makes dressing easy and fun. Then, sprinkle in those random trends that you love. Staying true to yourself and being confident in whatever it is you think is fashionable is the best style secret anyone will share with you. Jennifer Aniston has nailed the cool, laid-back but super chic aesthetic down and has done so for decades. How does she manage to look so good all the time? Olivia Palermo is another celeb who looks impeccable on every occasion, even when she’s not attending an event. She truly believes that taking time to get yourself ready for the day can work wonders on how good you look. Just remember, you are worth the time! 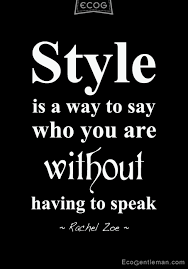 What is the best style tip you’ve ever received? For all things fashion, be sure to follow us on Facebook, Twitter, and Pinterest.